It's been a hell of a year here @ binnallofamerica.com. In January of 2005, we decided we were going to go full bore with BoA and really make it into an esoteric stopping point and a counter-culture iconic website. In the past year, we've evolved into just that. Throughout '05, our fantastic staff grew, first with the addition of the awesome Khyron, then the spectacular Lesley, followed by the infamous smoker dave, and the captivating R.Lee. Each has provided a unique perspective that helped binnallofamerica.com earn the reputation as an esoteric website of choice for inquisitive minds. I personally want to thank the BoA staff for all of their contributions in 2005. Along the way we produced numerous Feature Articles on breaking esoteric news like the ABC UFO Special, Pope John Paul II's death, and Tom Biscardi's meltdown on national radio. We also launched the critically acclaimed BoA : Audio series in the form of on-location interviews from April's X-Conference and lengthy interviews with such great esoteric minds as Jim Marrs, Peter Robbins, Greg Bishop, Grant Cameron, and many other outstanding researchers. We also covered the esoteric world with over 30 editions of Grey Matters, over 30 editions of The K-Files, over 50 editions of "the binnall report" and 60 hilarious Hot Newz pictures. We want to thank our readers who have supported binnalofamerica.com in 2005 and watched us grow and evolve. We promise that in 2006, we will continue to provide top-notch esoteric news and commentary, high quality interviews with the best in esoterica, and that off-kilter wit that you've come to expect from BoA. Join us now in a look back at some of the highlights of 2005 @ binnallofamerica.com. binnall kicked off 2005 with C2C 2004 : The Year in Coast and C2C 2004 : By the Numbers. The first ever binnallofamerica.com interview was conducted with Simon Aspinal, creator of "True or False". BoA message board theusofe.com is born. Khyron joins the binnallofamerica.com staff with Ghost Files. binnall Reviewed the C2C After Dark C2C. Moments after it aired, we had an ultra fresh review of the ABC UFO Special. binnallofamerica.com interviewed Terry Hansen on the ABC UFO Special. Our ABC UFO Special : Program Log with Segment Lengths and Quotes was picked up by Rense.com. binnall responded to two big Coast to Coast episodes with The Doty Show and The Chertoff Affair. binnall kicked off The Road to the X-Conference. It featured an 8 part preview of the Conference, an additional lengthy preview, and extensive post-Conference coverage. theusofe.com went in-house and ad free. We were all over the big news of the month Terri Schiavo. Pope John Paul II died and binnall reacted to the fall out in esoterica. 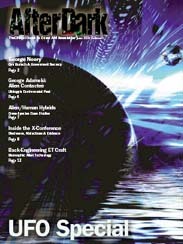 binnall's article on his trip to X-Conference is featured in Coast to Coast's "After Dark" magazine's UFO Special Issue. Lesley joins the binnallofamerica.com staff with Grey Matters. binnall of america : audio : The X-Conference Sessions debuted with Stanton Friedman. BoA shed its skin, moving the menu from left hand side to overhead. BoA was on top of the C2C 911 RT, with a preview, a quick 'n' dirty recap moments after it finished, and a full-length Round Up. Throughout the month, binnallofamerica.com was the first and only website to provide full coverage of April's X-Conference Press Conference at the National Press Club. binnall of america : audio featured an ultrarare interview with esteemed theologian Monsignor Corrado Balducci. We responded to Art Bell's schedule change with C2C Goes Host to Host. smoker dave joined the BoA staff as contributor. Tom Biscardi shocked the world and BoA had the first response on the net with Biscardi Bombshell : "Bigfoot Captured", which was updated throughout the "Biscardigate" saga. BoA : Audio, Season One had its season premiere with Jim Marrs. As part of Saturday Night Punnett, we began Faces of Punnett. A BoA annual tradition was continued with 20 Guests C2C Needs, Revisited and 2005's 12 Guests C2C Needs. Joining forces with The Debris Field, BoA linked up to Lesley's C2C Rewind. Khyron brought us The Jones Situation Part I and Part II. News Watch got an extreme makeover. Khyron's Ghost Files became The K-Files. Mahlory Mahling popped into BoA with a Special Delivery. BoA : Audio became available via Streaming Audio. Webster Tarpley was a special guest on BoA : Audio, Special Session. We celebrated Thanksgiving with Thanks be to Rense. The K-Files underwent an extreme makeover. R.Lee joined the BoA staff with Trickster's Realm. BoA Audio, Season One ended 2005 with a Christmas Eve Special featuring Stanton Friedman. The 2005 Coastie Winners announced. The complete list of over 365 updates for 2005 @ BoA can be found here.